Since entering the NHL in 1967 as part of the league’s very first expansion, from six teams to twelve, the Los Angeles Kings have provided their fans with numerous magical moments to remember and celebrate. The list of stars that have taken to the ice in a Kings uniform is a lengthy one: Rogie Vachon, Marcel Dionne, Dave Taylor, Charlie Simmer, Jim Fox, Bernie Nicholls, Luc Robitaille, Marty McSorley, Larry Robinson, Rob Blake and Kelly Hrudey to name just a few. You may recall that there was also that famous trade that brought one of the game’s greatest players to Los Angeles too. A young man known as The Great One. There is no doubt that every Kings fan has wanted to take a pass from a legendary defenseman like Rob Blake and break out of the defensive zone to start an offensive attack. Perhaps, you have dreamt of setting up Luc Robitaille for a one-timer in the final minutes of a game to clinch a victory. If either of those scenarios fired up your imagination, then now is your chance to turn your dream into a reality! From September 25th, through to September 28th, fans of the Los Angeles Kings will have the opportunity to take part in a unique four-day event in Las Vegas - the first annual Frozen Fury Fantasy Camp. Registered participants will play in four games with and against their LA Kings heroes. To make the event even more memorable, you will receive Frozen Fury jerseys and hockey socks, a Frozen Fury gift bag, VIP tickets to watch the Kings take on the New York Rangers and Colorado Avalanche, as well as entry into the Luc Robitaille Celebrity Poker Tournament. All of this exciting hockey action while enjoying everything that Las Vegas has to offer - talk about creating magical moments to remember and celebrate. In a recent interview, former Kings Captain and newest addition to the LA front office staff as the Assistant General Manager, Rob Blake, discussed the upcoming event and reminisced about his storied NHL career. An event like this fantasy camp not only provides a lot of fun and a tremendous experience for the fans, it is a great way for the Alumni members themselves to reconnect. Schedules get busy with work and family, so having the time to trade stories and catch up, creates a special opportunity for the former players as well. Proceeds from the four-day event go towards the Kings Care Foundation and that adds to the event and adds to the fun too. While camp participants are enjoying their time with some of their favourite LA Kings players, they are lending a helping hand to people in need. After an outstanding career at Bowling Green State University, Rob went on to play 1,270 NHL games with the LA Kings, Colorado Avalanche and San Jose Sharks. 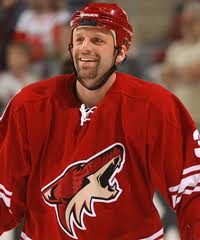 A Norris Trophy winner in 1998, he was a six-time All-Star and won the Stanley Cup in 2001 as a member of the Avalanche. Always willing to represent Canada, the Simcoe, Ontario native won gold at the Olympics (2002) and World Championship (1994 and 1997), making him a member of the very exclusive Triple Gold Club. Drafted 70th overall in the fourth round of the 1988 NHL Draft, Rob explained that his career with the Kings took an interesting turn in the summer of 1988. It was an exciting time for the Kings and their fans, and for a young player like Rob, his rookie season provided a marvellous opportunity to learn from one of the game’s greatest defensemen - Larry Robinson. As fans, we watch the games and see the pressure that players are under as the clock winds down. With three minutes left on the clock and a one-goal lead, we are on the edge of our seat, hoping our team can hang on. Rob was no stranger to those moments, so I asked him, as a Stanley Cup champion, Olympic champion and World champion, what did it take to be on the ice and close out those important games in pressure-packed situations? Throughout his career, both in the NHL and Internationally, Rob played with several tremendously talented, all-world goaltenders: Kelly Hrudey in Los Angeles, Patrick Roy in Colorado and Martin Brodeur in the 2002 Olympics for example. I asked about the age-old adage that a goal post is a goalie’s best friend - does that make a great goaltender a defenseman’s best friend? With his impressive résumé as a player, Rob’s focus now shifts to finding and evaluating the talent of others as the newly appointed Assistant General Manager in Los Angeles. The Kings captain for five of his eleven seasons in LA, in many ways, it is like coming home again for Rob and his family. Sharing a locker room, scoring goals and hearing stories from LA Kings legends like Rob Blake, Luc Robitaille and Jim Fox, while spending four days in Las Vegas - what could be better? Dreams do come true!